All of our specialty pizzas are Skipolini's original creations. It is difficult to recommend one over the other, for all of these items are tested in our restaurants. If they don't receive over a 95% approval rating then they don't go on the menu. Figure out what you are in the mood for and let our server give you some guidance. The good news is that you can't go wrong with any of them, they are all amazing!!! *Price and sizes available applies to Prego Pizza only. All other Specialty Pizzas priced as "5 or more" topping pizzas. 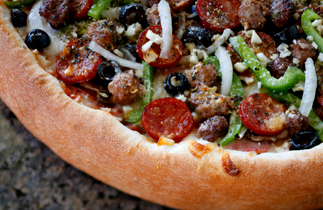 Salami, Pepperoni, Mushrooms, Olives, Bell Peppers, Onions, Sausage and Ground Beef. Mushrooms, Olives, Bell Peppers, Onions, Artichoke Hearts, Zucchini and Fresh Tomatoes. Pesto Sauce, Zucchini, Artichoke Hearts, Fresh Tomatoes, Oregano, and Parmesan. Kinder's Barbecue Sauce, Chicken, Onions, Bacon, and Mild Green Chilies. Salami, Pepperoni, Ham, Bacon, Linguisa, Sausage and Ground Beef. Creamy Pesto Sauce, Mushrooms, Onions, Zucchini, Artichoke Hearts and Bacon. Creamy Pesto Sauce, Artichoke Hearts, Chicken, Red and Yellow Bell Peppers. Creamy Pesto, Olives, Red Onions, Mushrooms, Red and Yellow Bell Peppers, Chicken and Feta Cheese. Roasted Garlic Sauce, Red Bell Peppers, Roasted Garlic, Fresh Spinach, Cayenne Chicken, Sun Dried Tomatoes, Freshly Grated Parmesan cheese. Roasted Garlic Sauce, Chicken, Artichoke Hearts, Green Onions, and Sun Dried Tomatoes. Roasted Garlic Sauce, Fresh Spinach, Light Mushrooms, Light Ham, Light Bacon, and Diced Tomatoes. Roasted Garlic Sauce, Chicken, Red Bell Peppers, Fresh Spinach, Fresh Basil, Red Onions, Roasted Garlic, Feta Cheese. Roasted Garlic Sauce, mushrooms, sausage, fresh grated parmesan cheese, and extra black pepper! !